There are some good reasons why people have beige walls. You might feel shy about color or you are renting a home with beige walls and cannot paint. Perhaps your home will be on the market soon so you want to keep it neutral for resale appeal. But what if, despite this, you are bored and you want to spice up the walls? 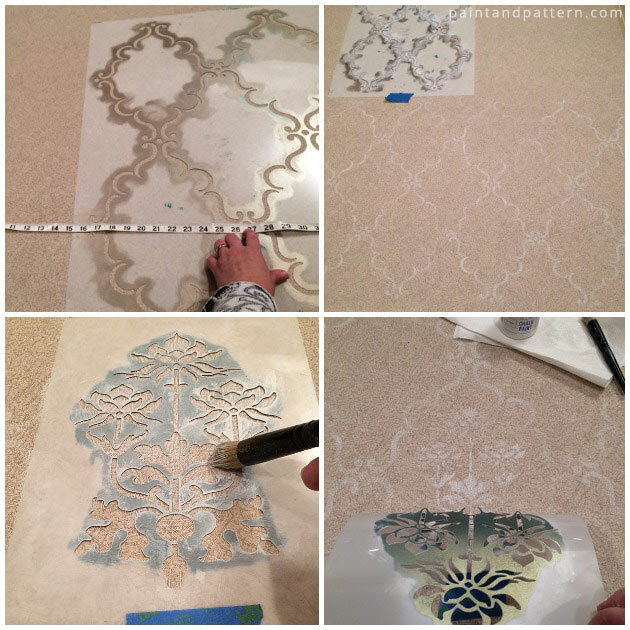 You can stencil with white! Not only that, you can stencil on remnant wallpaper or even use removable wallpaper and hang it on the walls as a temporary fix. I used this solution to add a dash of pattern to our basement walls. I’ve been bored with the beige wallpaper there. Everything in the basement is beige. But I don’t want to remove perfectly good wallpaper from a large room. And we may put our house up for sale sooner than later, so I needed a neutral and temporary solution. I found an extra roll of the wallpaper in the darkest, spidery-est corner of our basement. So I bravely pulled it out, cleaned it off, unrolled it and stenciled on it. 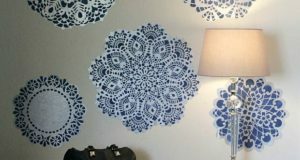 Depending on your situation, you can stencil on a length of wallpaper remnant, or stencil directly on walls. Removable wallpaper by Wallternatives is another option to add patterns to your walls. This month’s Scandinavian theme made me think of light rooms and walls, which led to inspiration photos of gray, beige and white patterns that look old and faded. I hope this project can show you how stencils can look dramatically different when you paint with different colors. I have used these same stencils previously in more colorful projects. (And, uh, obviously forgot to wash some of them!) 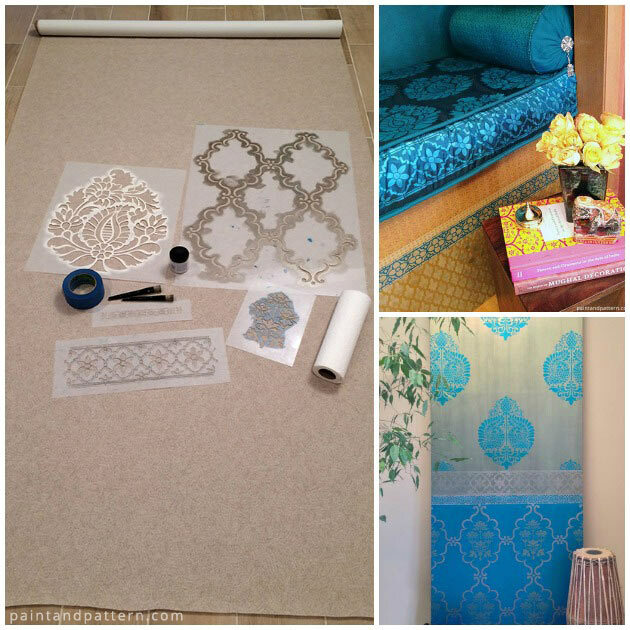 The small Rani Paisley stencil was used in teal blue color to make silk cushions of the Indian-Moroccan closet nook. And I also painted a similar combination of stencils on a sari-inspired stenciled door in shimmery blues, golds and oyster colors. 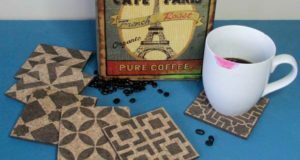 Today, I’ll show you how to use these same patterns, but with a vintage, faded effect in white. It’s just a light dash of Indian pattern spice instead of a huge color splash! Measure the height of your wall. 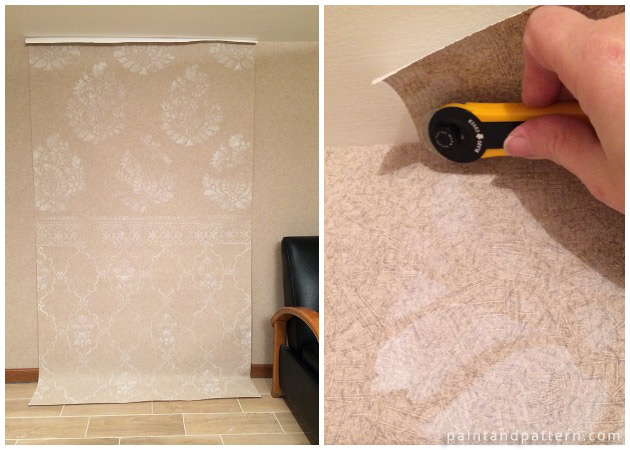 Then simply unroll your wallpaper and cut a length that’s the height of your wall. You can paint numerous lengths of wallpaper to piece together, but I painted one length to hang as an accent behind a table. 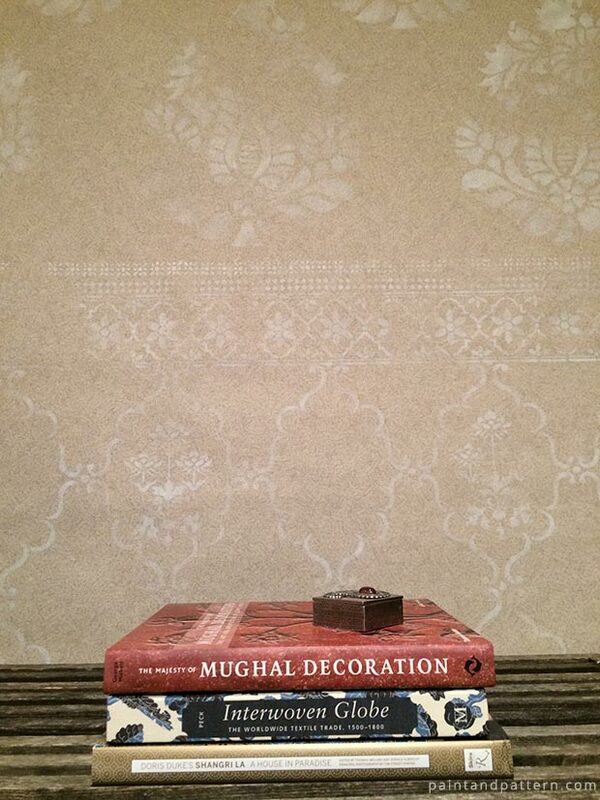 Measure to find the center of your wallpaper and place the middle of your stencil in the middle of the wallpaper. 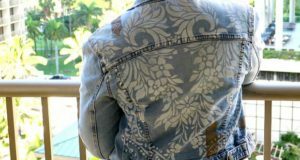 Because your pattern will be running off the edges and one piece of wallpaper is easily viewable in one glance, if your pattern is off-center it will be noticeable. Next, the fun stuff — painting! If you want a vintage faded effect, offload almost all of the paint from the brush onto paper towel, so your brush is almost dry. Then lightly fill in the stencil unevenly, leaving some areas looking faded. I even neglected to paint entire areas of some patterns. I just skipped them so it would look like areas of paint had been worn away over time. Resist the urge to fill in paint evenly everywhere. Sometimes it was hard to see what had already been painted, and I kept peeking under the stencil to check. Also, if you’re using different stencils next to each other, continue working with the faded effect across the stencils. You likely would not have a crisp dark pattern right next to a barely-there ghostly image. I made up a story as I went along, and imagined this section of wall was taken from a building where people had leaned against the wall maybe while waiting in long lines. So the middle and lower part is more faded, and the patterns above people’s heads are more even. Hey, you have to find something to think about to pass the time! Because you’re painting very lightly with Chalk Paint, the paint will dry quickly, so you can probably hang it up right away. You can try different adhesives and see what works with your wallpaper. My wallpaper is a thick vinyl paper and I found neither repositionable glue spray nor double-sided tape worked to hang it up. I wound up nailing it up with a few very small nails. Because my paper is so thick, it laid against the wall with just a few nails. Check if your wallpaper is pre-glued or not. If you want your wallpaper to be removable, I wouldn’t use a wet spray if the wallpaper has glue on it, because you don’t want to activate the glue. While hanging the paper, I left extra paper hanging loose at the top and bottom of the wall, and I cut the paper along the edge of the ceiling and floor. This seemed to be the easiest way to get the paper to fit the wall height. Although if you’re really good with measurements, you could cut the paper to size before hanging it. Here is a corner of the basement styled up with just a whisper of pattern! 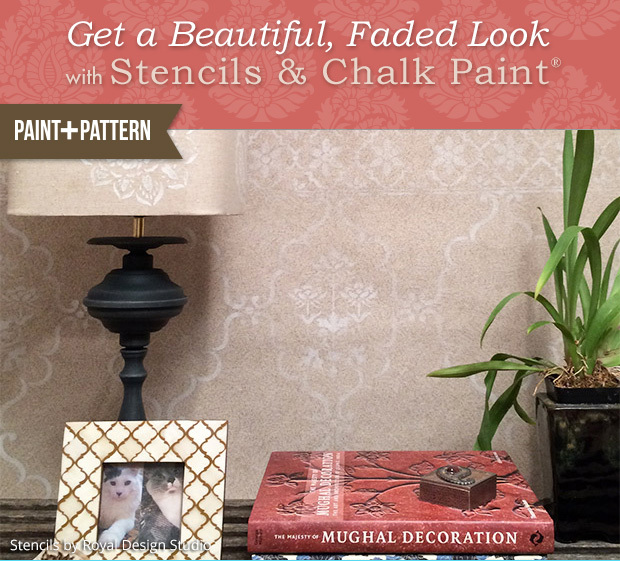 Know someone who might like to try this old wall painting effect? Be sure to share it with them! 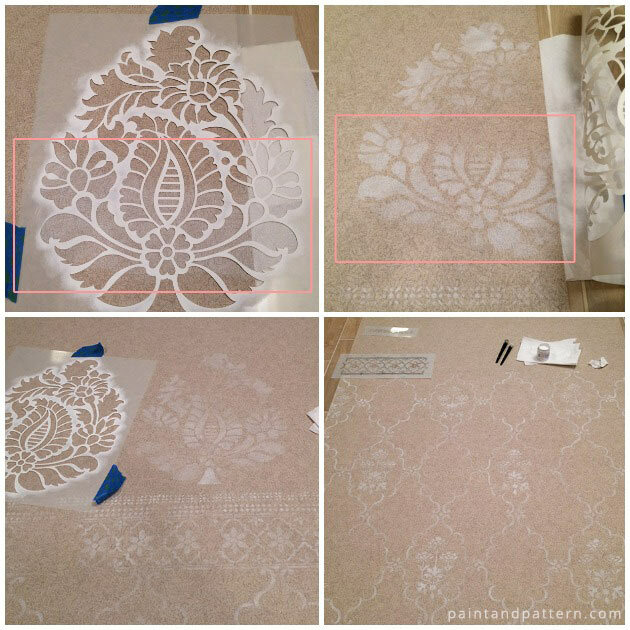 Explore our Pinterest page as well as our How-to + DIY section here on Paint + Pattern for more stencil ideas! I am a fan of stenciled walls. We recently moved to new home and I miss my art room with stenciled walls from old home. 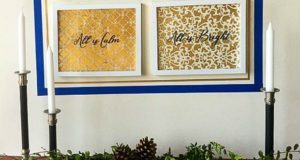 I am definitely looking to do more stenciling in new home and have loved your post. 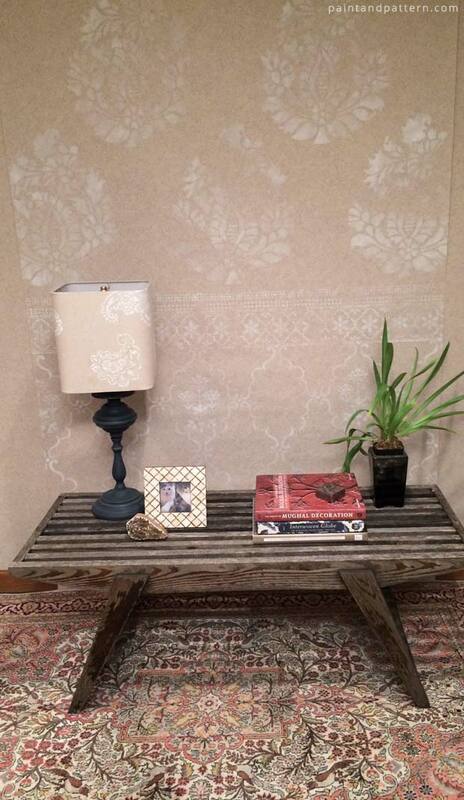 Absolutely love you little corner with stenciled walls, Deb! Thank you for sharing!